At Connect IT 2010, Sidat Hyder shall be showcasing its Information Solutions portfolio for Small & Medium Enterprises (SME’s) with specialist product suites for Textiles, Pharmaceuticals, Retail, Real Estate, Construction, Food and Allied industries. Sidat Hyder is also heavily engaged in mobile application development for iPhone, Android, BlackBerry, Brew & Symbian platforms. Our experts in different practice areas will be there to welcome you. Its that time of the year again! 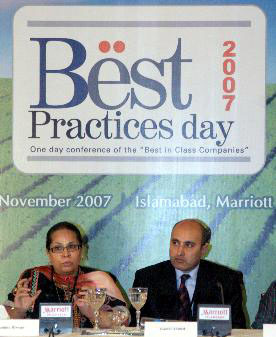 And once again, Sidat Hyder Morshed Associates (SHMA) is proud to announce its flagship event, Best Practices Day (BPD 2009), being held in Karachi and Lahore. Our BPD conference, which continues to be the premier event for professionals interested in honing their competitive edge, has grown to become one of the largest events of its kind and this year, in light of the reigning economic climate, the theme of the event is "Survive, Sustain and Succeed"
This year, Speakers will be invited from best in class organizations to share the strategies, innovative approaches, theories and tools that they have employed and which have successfully added vitality to their businesses in these tough times. Particularly, speakers will be invited from organizations that have not only survived the economic downturn but have ensured business sustainability and are gearing up for future successes. Like always, participants will also have the opportunity to meet, network and form partnerships with key corporate professionals and leaders including CEO’s, senior executives, departmental heads, managers and dignitaries from various walks of life. Based on past trends, this year we anticipate attendance of around 750 delegates representing of over 300 corporate entities from various sectors in Karachi and Lahore. After successful delivery of IT and Consulting services to over 15 countries in a spectrum of industry segments, Sidat Hyder expanded its operations to the GCC region by establishing an office in Dubai just last year. “With a successful first year, we are ready to actively pursue the ME market. It gives me great pleasure to inform you that our Information Solutions are geared to cater to the needs of the market. Furthermore, we are ready to unveil a GCC version of our Investments Portfolio Management Solution (iPaMs) after the GITEX 2009,” says Mr. Arooj Alam Khan, Director Sidat Hyder. We have consistently been part of the three-day annual event since its beginning, promoting and educating stake holders, businesses, students and others from the IT sector in the country. Mr. Arooj Alam Khan, Director Information Solutions at Sidat Hyder, spoke at the conference. He discussed ERP applications and the opportunities it opens for the country’s IT industry. Sidat Hyder’s team also displayed its IT product range and services including Supply Chain Management and Financials systems. 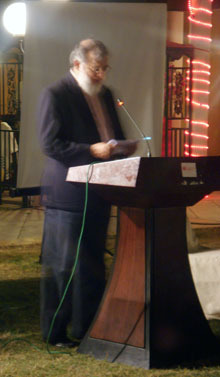 Syed Tahir Ali, Senior Manager speaking at the ITCN Asia 2009 Conference. Sidat Hyder Morshed Associates (Pvt.) 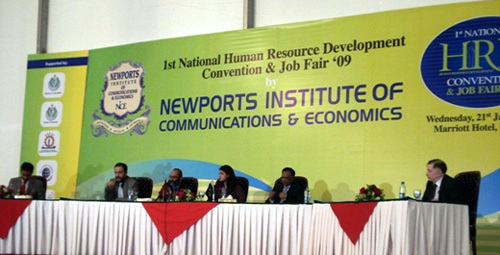 Ltd. participated in the 1st National HRD Convention and Job Fair organized by the Newport Institute of Communications & Economics on 21st January 2009 at Marriott Hotel Karachi. The objective of this event was to promote opportunities to ensure effective utilization of human capital in the business arena by using latest HR techniques for the benefit of national development and overall prosperity. Representing Sidat Hyder, Ms. Samia Zuberi took part in a panel discussion on the topic “Scope of HR Consultancies as a role model for Talent Hunt” and she highlighted the importance of industry interaction with the academia which would assist in the grooming of up coming talent in Pakistan. The HR consulting division of Sidat Hyder also displayed their diverse range of products and services including Executive Search and Placement Services at the Job Fair. More than 10 organizations participated in the job fair to provide opportunities to visitors to enter their CVs in their databases. Sidat Hyder will be participating at the DAWN Asia Finance Conferences this year. This will be the fourth exhibition & conference after the series of three Asia Finance exhibitions & conferences held by DAWN in the last three consecutive years. Since the banking sector one of the largest consumers of IT technology products, we hope to see corporate executives, technology professionals and finance professionals from leading banking institutions, fund managers, insurance companies, IT service providers and others. Sidat Hyder will be showcasing its cutting-edge information solutions & services portfolio for the Financial services industry including Asset Management, Banking, Insurance, Investments, Capital Market and others in the financial sector. We will accordingly contact you and schedule a meeting. We look forward to meeting you and establishing a mutually beneficial relationship. PharmEvo, one of the leading pharma companies, and Sidat Hyder recently celebrated ‘Go Live’ of Sidat Hyder Suite of Business Applications at the pharmaceutical company. The ceremony was held by PharmEvo on Tuesday, May 13th, 2008 at the Ramada Plaza Hotel. The companies celebrated the successful implementation and execution of Sidat Hyder – Financials, Human Capital Management (HCM) and Supply Chain Management System (SCM) at PharmEvo. The ceremony was inaugurated by Mr. Haroon Qasim, Managing Director PharmEvo, shedding light on the vision of PharmEvo and its achievements in the healthcare industry. Mr. Qasim explained that PharmEvo required a fully functional, scalable and flexible solution to fit the company’s growing needs. He explained that the adoption of Sidat Hyder technology will improve PharmEvo’s visibility into qualitative and financial data, allowing it’s planning, production and finance departments to take accurate and timely decisions. The evening ended with a note of thanks by Dr. Munir Anwar, Technical Director PharmEvo, to the entire PharmEvo and SHMA teams for their dedication and cooperation in the successful implementation of such a large-scale project. The implementation and support teams were jointly presented achievement certificates and awards by Mr. Ebrahim Qasim, CEO of Premier Group, and Mr. Omer Morshed, Director of Sidat Hyder Morshed Associates. Sidat Hyder has been serving Pharmaceutical companies for years now. SHMA’s Information Solutions for Pharmas is a ‘tried & tested’ suite of business applications that supports growth, optimizes operations and reduces operational costs substantially. Sidat Hyder has a trained and experienced staff that harbors the knowledge base to adequately serve the pharma sector. Sidat Hyder Morshed Associates held 'Best Practices Day' conference in Islamabad. The conference (Best Practices Day or BPD) was aimed to enable the participants in gaining an understanding of how companies implement best practices to achieve competitive advantages and organizational success in today’s market. “We believe that the need for adopting best practices has become important in recent years to achieve and sustain organizational success and positive growth in an increasingly competitive business environment and globalization. This event provides organizations with an ideal opportunity to share and exchange their experience, ideas and insights in order to achieve sustained growth and quality performance,” Omer Morshed, Director of Sidat Hyder, said in his opening remarks at the inaugural session. Speakers included included Sadia Naveed, Director Operations at English Biscuit, Zafar Aziz Osmani, SEVP-HR & Organisational Development of Habib Bank, Anila Weldon, CEO of Weldon BBS Internet Marketing, Attiya Nawazish Ali, Assistance Secretary-General of the Islamic Chamber of Commerce & Industry, Noman Saeed of National Bank, Asad Zaid, Senior Manager, Information System Department, EBM; Mansur Ahsan, Executive Director HR at SECP; Asad Umar, CEO at Engro Chemical; Nasim Baig, CEO of Arif Habib Investment, and Taher Sachak, CEO of EFU Life. A good representation from Telenor Pakistan, Business Support Fund, Chevron Pakistan, Macter, Novo Nordisk, Engro Foods, the Karachi Electric Supply Corporation and The Citizens Foundation was seen at the event. Sidat Hyder will be participating at GITEX Saudi Arabia 2007, being held in Riyadh on 15-19 April 2007. This will be the 6th GITEX Exhibition to be held in Saudi Arabia. GITEX is an International Information Technology Exhibition that brings key IT decision makers and service providers from across the Middle East and the World under one roof. The event is attended by top IT professionals exhibiting state-of-the-art IT solutions, foreign investment-seeking public sector decision makers and private sector professionals seeking investment opportunities across the globe. Sidat Hyder will be showcasing its cutting-edge information solutions & services portfolio for the Investments, Insurance and Financial sector. We have recently setup an office in Dubai, from where we are actively operating in the GCC countries. We are also actively recruiting business partners to create opportunities and enhance our business presence in the region. If you would like to meet us at this event, please send an email to shmakhi@sidathyder.com.pk We will accordingly contact you and schedule a meeting. We look forward to meeting you and establishing a mutually beneficial relationship. Sidat Hyder will be participating at MEFTEC 2007, being held in Bahrain 0n 12-13 February 2007. We shall be showcasing our information solutions & services for the Investments, Insurance and Financial sector. Sidat Hyder has recently setup an office in Dubai and is also actively recruiting business partners in Bahrain. If you would like to meet us at this event, please send an email to shmakhi@sidathyder.com.pk we will be in touch with you for scheduling the meeting. Increased competition and rapidly evolving technologies present business challenges with respect to market penetration and reach for organizations. Organizations, today, understand how critical it is to establish partnerships to be able to cater to untouched markets. What holds even more significance is the key activity of knowledge dissemination to ensure the right vision is being communicated, the right facts are being communicated and the right sales practices are being adopted. Intel Pakistan held an all-Pakistan Road Show for its Dealers' Network and RSPs (Retail Sales Persons), which commenced on November 21st, 2006 in Karachi. From Karachi, the Core 2 Duo Road Show traveled to all major cities, introducing the latest Core 2 Duo technology and its selling practices to Intel dealers across the country. The highly-interactive sessions also proved to be a training ground for RSPs. 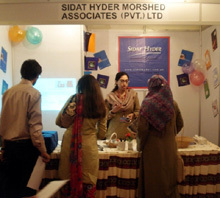 Sidat Hyder Morshed Associates participated at the Road Show, showcasing its Information Solutions Suite. Considering its extensive industry exposure and ability to cater to business management and accounting requirements of all types, Sidat Hyder announced its interest in expanding its market reach by catering to IS requirements of markets catered by Intel Dealers. Organizations and individuals seeking new revenue streams and driving the concept of 'One-Stop-Shops' showed interest. Hoping to establish a mutually beneficial relationship with all interested parties, Sidat Hyder traveled with the Intel Road Show across Pakistan. SMEs face an increasingly complex environment today including global competition, heightened customer expectations and increasing regulatory requirements. With growth, a company's systems processes and business information increase in complexity. This puts increased pressure on the limited resources that SMEs have. Oracle understands the challenges SMEs are facing and has designed this event. "Oracle Non- Metro City Road show" (NMCR) to help SMEs simplify their business to improve performance. Sidat Hyder, shall be participating at this event to showcase its Information Solutions powered by Oracle technology to help SME’s in Pakistan and will share success stories in the Pakistan marketplace. Sidat Hyder – Information Solutions have industry specific offerings for Home textiles, Life Sciences/Pharmaceuticals, Constructions & Engineering, Manufacturing, Trading, Not for Profit Organizations and many more such verticals. Sidat Hyder Morshed Associates (SHMA) presents a one day seminar on Bancassurance to be held at Karachi Sheraton Hotel, on November 15, 2006. Bancassurance - Concepts, Opportunities and Challenges 2006 Seminar is a unique and comprehensive one day forum that offers a platform for banks and insurance companies in Pakistan to establish mutually beneficial relationships aimed at enhancing product sets and market penetration. Commencing with an introductory note on the concept, the seminar is a day full of stimulating presentations and interactive panel discussions laden with an opportunity to establish relationships between banks and insurance companies. The Seminar aims to bring together professionals from Insurance and Banking sectors as well as scholars and business executives from corporate sector in Pakistan there by assembling an unparalleled forum presenting well learnt experiences and Bancassurance practices from other countries, creating the much needed awareness of the concept in Pakistan, and exploring ways to adapt and innovate financial products to cater the needs of consumers, banks and insurance companies, simultaneously. You can participate in “Bancassurance – Concepts, Opportunities and Challenges” seminar as a delegate by registering yourself and attending various rejuvenating presentations. The registration fee is PKR.3000 per delegate. You can also participate in “Bancassurance – Concepts, Opportunities and Challenges” seminar as a promotional partner by sponsoring banners, promotional desks and corporate branding activities. For more information, please contact. Sidat Hyder Morshed Associates (Pvt.) Ltd is privileged to announce its flagship event, the annual Best Practices Day Conference on 23 November 2006. Best Practices Day is a day of stimulating presentations and interactive panel discussions, with the opportunity to network with business leaders and senior executives from across Corporate Pakistan. As various presentations are taking place concurrently, participants have the opportunity to learn, share and interact according to their specific field of interests and areas of focus. Best Practices Day 2006 is an unparalleled opportunity for participants to gain valuable insight into the best practices of other companies. The sharing of such knowledge helps companies to benchmark, identify areas of development and achieve organizational success. You can participate in BPD 2006 as a delegate by registering yourself and attending the various presentations and panel discussions. You can also participate in BPD 2006 as a promotional partner by sponsoring banners and advertisements. Venue: Best Western Hotel, Islamabad. Training Needs Assessment (TNA) is one of those subjects that makes a Human Resource Professional wince….there is a general feeling that it is important and should be an intrinsic part of any training strategy….but what exactly does it mean? Is it really a practical concept and of any real relevance outside the textbooks? Or is it a necessary but less than useful exercise conducted by HR departments? What is the objective of this exercise? Can it be carried out using different approaches? What are the different approaches that may be employed? In case you share some of the above mentioned concerns, our workshop on ‘How to Conduct a TNA’ would be beneficial for you and your organization. In this one-day workshop you will be provided an overview of the concept behind conducting TNA in organizations. You will also be introduced to the different approaches used for conducting TNA and the role of the individual and organizational factors that contribute to shaping a TNA strategy. The key link between Succession Planning and TNA will also be discussed. How will we go about it? The workshop will be highly interactive and during the workshop, participants will practically experience applying actual TNA tools wherever possible. HR Audit is a powerful tool which may be used by organizations to take a fresh look at their existing HR policies and people, and drive change, if required. The spectrum of an HR Audit encompasses varied aspects of HR. The audit review includes, but is not restricted to, a review of HR policies and procedures, stock taking of their 'human resource assets' in terms of qualification and experience vis a vis job responsibilities, reassignment of job duties, undertaking organizational or climate survey, examining the effectiveness and role of other organizational policies related to performance evaluation systems,recruitment and selection processes, training and development opportunities, assessment of organizational and compensation structure, safety, health and environment measures, etc.